Alaskans know how to eat. Find another place where people are better at DIY food (hunting it, fishing it, picking it; schlepping it on airplanes, ATVs, snowmachines, kayaks, in backpacks; butchering it, cleaning it, smoking it, freezing it, preserving it). You can't. To eat at our tables is to understand our culture. (Home cooking is another area where we excel.) This new newsletter is a place for all things Alaska food. Send your feedback, Alaska food ideas and questions! The last week or so I've gone deep into the vintage cookbook nerd forest, looking at the history of a nostalgic baked fish dish that's made in different variations all over Alaska. I knew it as halibut Olympia. It's also called halibut Alyeska (made with cheddar cheese on top and maybe some canned fried onions), halibut Caddy Ganty (fish is soaked in wine before baking and rolled in breadcrumbs) and halibut Sitka (there's chopped green onions in the sauce). There are many, many recipes, but they all involve two things: halibut and mayo. If you grew up here, they likely taste like family dinner. The earliest reference to a recipe like this that I could find was in 1959. 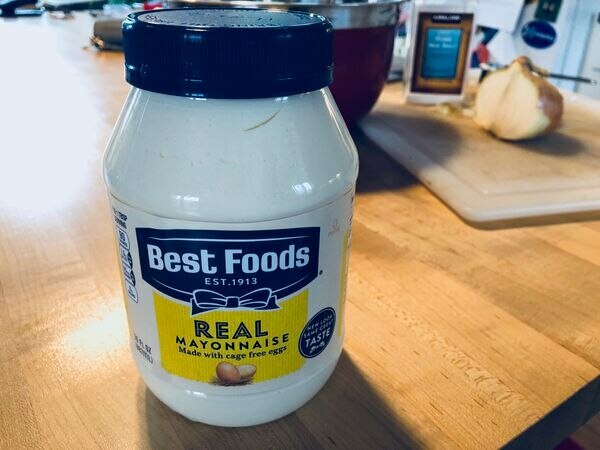 With the help of a number of community recipe testers, I came up with a new recipe that hits on the notes of many I read, and doesn't deviate very far from the one on my childhood table, but (shhhh, don't tell Mom) is, dare I say it, just a little better? I toned down the onions and added mustard and Tabasco for a little kick. Soaking the fish in wine is optional. 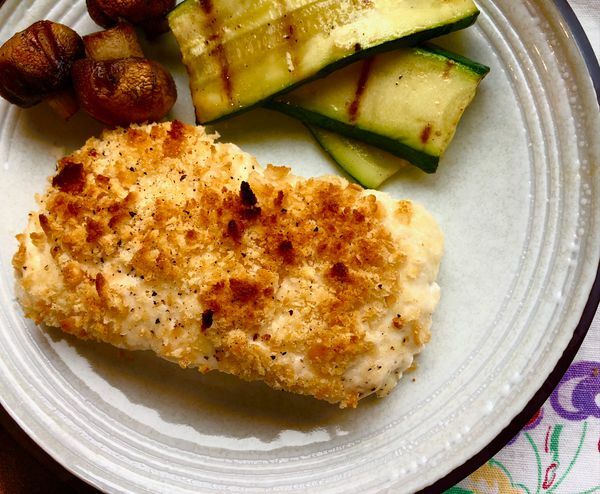 Sure, you could lighten up my recipe with Greek yogurt instead of sour cream and mayo, and you could sub in panko for cracker crumbs, but doing that, to me, seems kind of wrong. A little like the idea of Costco no longer selling Polish dogs in the food court. But, then, all this cookbook research makes me nostalgic. If you must go lighter, stir some lemon juice and parsley into the yogurt and let me know how it goes? It's possible, too, you're one of those people with no love for halibut. And maybe you're reading this in the same condition that I'm writing it, that is, you're still hungry for breakfast. 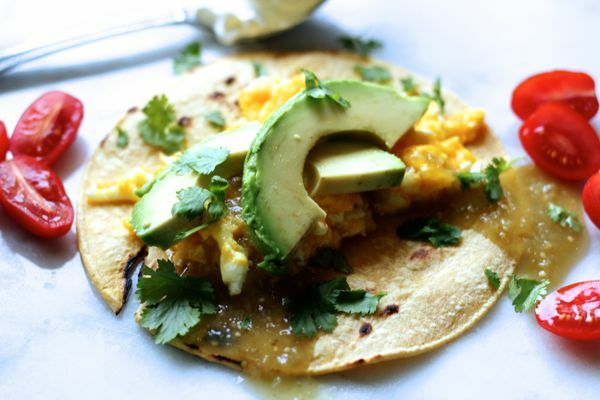 Maya Wilson's pictures of her green breakfast taco recipe will make you want to drop everything and find the nearest avocado. Have you made it to a farmers market yet? If not, this weekend might be your moment. Market columnist Steve Edwards says recent hot weather seems to have helped a number of veggies reach harvest stage. You'll find broccoli, cauliflower, kale, spinach, Easter Egg radishes, greens mix, baby lettuce mix, escarole, pac choi, rhubarb, arugula, leaf lettuces, chives and basil, among other things. Oh, and hey, want to know something cool? Anchorage-grown chef "Delicious" Dave Thorne, who has been cooking at the exclusive Sheldon Chalet in Denali National Park, was just featured in Food & Wine magazine. Please send me your Alaska food questions and ideas or help me test recipes! Here's hoping your topping is crispy and your center isn't overdone.